The new N1 tablet is a thinner, lighter, Android-powered iPad. When Microsoft bought Nokia last year, it was only buying a chunk of the Finnish company. The $7.2 billion pricetag was for Nokia's mobile device business unit, but left the rest of the company intact and independent. And with Microsoft transitioning its little slice of Nokia Lumia heaven into the fold as "Microsoft Lumia," the real Nokia can come out of hibernation, and get back to business. Enter the N1 tablet, Nokia's first foray into mobile/tablet hardware since the Microsoft deal. If it looks familiar, that's because Nokia has teamed up with Apple manufacturing partner Foxconn to build the N1. Nokia does all the design work, while Foxconn does the production, assembly, and heavy lifting. This partnership represents the future of Nokia, as the firm will stick to design and software, licensing out to other established manufacturing firms. So yeah, the 4:3 N1 looks a lot like Apple's iPad Mini, but there are several key differences. For starters, the N1 runs Android 5.0, and not Apple's iOS. Along with Android is Nokia's Z Launcher, which acts as a start menu of sorts for the OS. It allows you to write any letter on the screen with your finger, and the tablet will start a search accordingly (dial D for Dropbox, for example). The Z Launcher can also sort your contacts, other info by location and activity. While it might share a design cue or two with the iPad Mini, the N1 is both thinner (6.9mm), and lighter (11.2 ounces) than Apple's offering. It's also one of the first devices on the planet to use the new reversible USB C-Type connector. That means you can plug in the N1 with either side of the connector facing up. Other hardware includes a 2.4 GHz quad-core Intel Atom processor, 2 GB of RAM, 32 GB of storage, and a straight-from-the-Apple-stockpile 7.9-inch, 2048x1536 display. Cameras include an 8 MP shooter on the back, and a 5 MP sensor up front. Nokia is pricing the N1 at $249, with an initial launch in China. 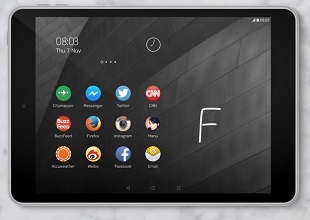 There's no word on if or when the tablet will make it to North America, the Z launcher software can be installed on Android phones via Google Play, starting today.